New England Patriots tight end Martellus Bennett and defensive back Devin McCourty have promised to turn down the invitation. 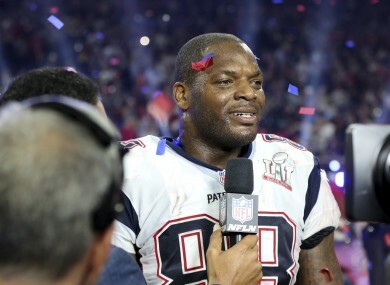 IF THE NEW England Patriots receive the traditional Super Bowl winner’s invitation to the White House, tight end Martellus Bennett won’t be involved in the visit to see Donald Trump. Bennett told the Dallas Morning News he would not be attending the usual honour ceremony from the US President, all-but certain given Trump’s public support of the Patriots and star quarterback Tom Brady. Bennett’s tweets in the wake of the controversial travel ban against seven majority-Muslim countries imposed by Trump before being halted by a US judge spoke of inclusion and love trumping hate. Bennett added that he is unconcerned about possible punishment for a Trump snub from Patriots owner Bob Kraft or Tom Brady, both friends and supporters of Trump. Politics are not a locker room topic for the Super Bowl champions, Bennett said. Bennett is not the only Patriots player to announce a boycott of the ceremonial White House visit as defensive back Devin McCourty also says he will not be making the trip to Washington. According to McCourty, attending the White House ceremony is a personal choice. “I can’t imagine a way I go there,” he said. While McCourty and Bennett are not the first players to turn down a visit to the White House, their reasoning resonates for many in the USA. After his presidential victory, Trump has become an even more controversial figure, especially in the wake of his recent executive order restricting travellers from seven predominantly Muslims nations from entering the USA. Email “Super Bowl winners to boycott visit to the White House in Trump protest”. Feedback on “Super Bowl winners to boycott visit to the White House in Trump protest”.